1) Previously you could only attach one file to an event and this file was not include in event invitations. Now you can add as many files as you like and a link to each file will be part of the event invitation email. 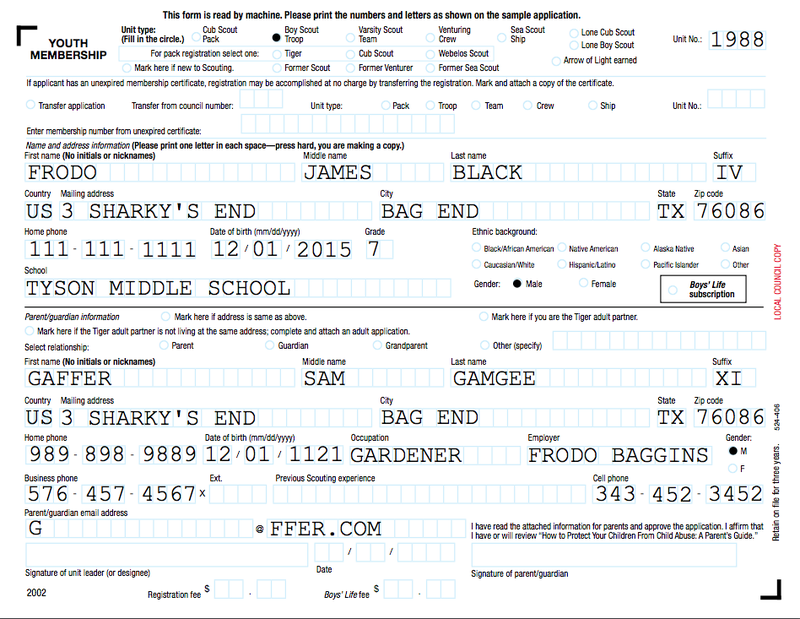 2) Sign up sheets did not support parents volunteering on behalf of their children. This is now possible, thanks to Spencer. We are still working on the 2016 rank requirement changes for BSA. They will go live Monday morning. I hope you had a fun, safe New Year's Eve! 1) If you uploaded a custom email header for your account and then tried to edit any account settings, such as updating your site-wide announcements, you would get a page that said "We're sorry but something went wrong." This is fixed. 2) If you used a filter on the "Present Awards" screen and you also used the "check all" box, it would ignore your filter and check everything. This is fixed. 3) If you have turned on the "copy parents on all scout emails" setting and a scout uses quick message to SEND an email, it will now copy the parents too. Have a great and safe New Year's Eve! Thank you for a great 2015! We are going to have a brief outage this morning as we perform an upgrade. It should start at approximate 8:30 AM CT and last for only a minute or two. Thanks for your patience! We released three changes this morning, and one of them is important if you've ever tried uploading photos from an iOS device on the web site. 1) There was a typo in the subject of the TroopTrack Developer Program welcome email. Instead of welcoming you to the developer program, it welcomed you to the AHG Admin Portal. Sheesh. Speaking of the developer program, here's a little teaser of things to come. We get a lot of requests from people to be able to download all their photo albums from TroopTrack at once. We are working on a desktop product that will do that. It will work on OS X, Windows, and Linux, and best of all... it will be open source software and will leverage the TroopTrack platform API. 2) If you uploaded multiple photos from an iOS device at the same time (i.e. 5), instead of getting five photos in your TroopTrack album you would get 5 copies of the first photo you uploaded. This is now fixed. Yay! 3) We added a note to the subscription receipts page about PayPal subscriptions, clarifying that PayPal receipts are only available on PayPal.com. It's Christmas Eve! Have a wonderful day! 1) The "check all" box on attendance was ignoring your choices in the filter. So if you filtered to a specific patrol and then clicked check all, it was checking everyone, not just the patrol you filtered on. Spencer fixed this and the filters and the check all box on attendance now play nice together. 2) Awards with lower case names were being sorted last on the award ceremony agenda. Sorting of award names no longer cares about whether the award name is capitalized or not. 1) Need a detailed receipt for your subscription so you can get reimbursed? It's now available on Manage -> Settings -> TroopTrack Subscription. See the screenshots I've attached. 2) When a user looks at money accounts they have access to, it used to show the total balance of ALL money accounts at the top. We've fixed this so that it only shows the total balance of accounts they have access to. 3) Awards are now sorted by award name, then last name of the recipient on the award ceremony agenda (Achieve -> Print Agenda by Patrol). 4) If you use the "Copy parents on all emails setting" and you had a deactivated adult in a household, they were getting copied on emails to youth in the household. We have fixed this so that only active adults will receive emails. 5) Have you ever wanted to know which users only have household access levels or can edit achievements? 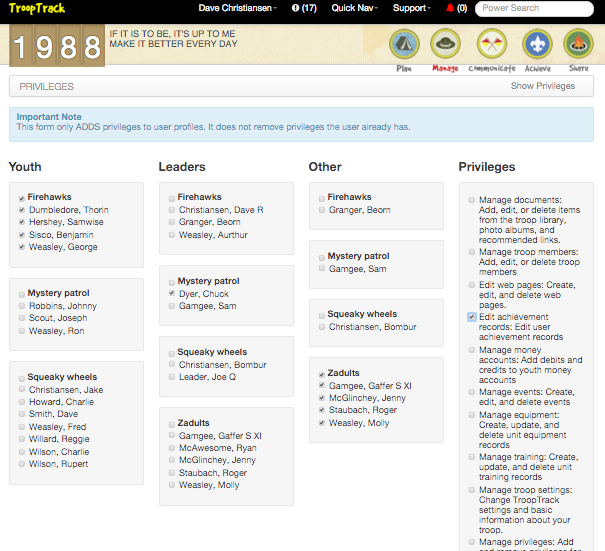 Now you can look at privileges and access levels across all your members and filter them by access level and privileges. Just go to Manage -> Members -> Privileges to try it out. See the screenshot below. 6) Have you ever wanted to add photo upload privileges to everyone or done some other mass update of privileges? You can do that now too. Just go to Manage -> Members -> Privileges then click on "Add Privileges". See the screenshot below. Last week we had a nice conversation on Facebook about the way we display rank information & merit badges. I've started working on this but it's not ready to release yet. We'll keep you posted. Also, you might notice that we have a check all box by each patrol on the new bulk privileges page. We have a number of places in TroopTrack where we don't have this feature but should. 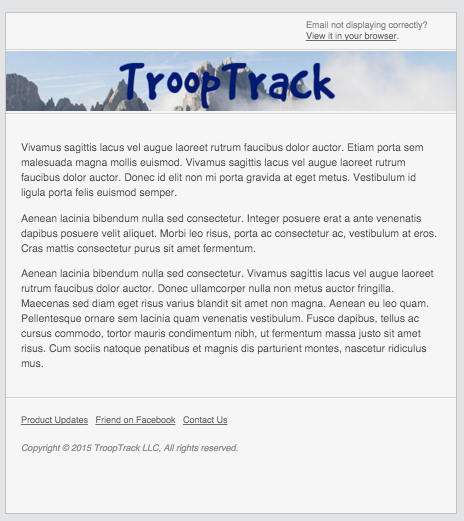 We are working on this and you should see more check all capabilities throughout TroopTrack. If you have a place where you want this real bad, just open a help desk ticket and let us know. 1) You can now upload your own email header image for emails to your members. Just go to Manage -> Settings -> Edit Troop Settings (see screenshot) to upload a 600px wide image to be used on your emails. TroopTrack sends a lot of emails, and it's possible we have missed some. If you find that to be the case, please open a help desk ticket and let us know. 2) Announcements can now be assigned to a patrol. 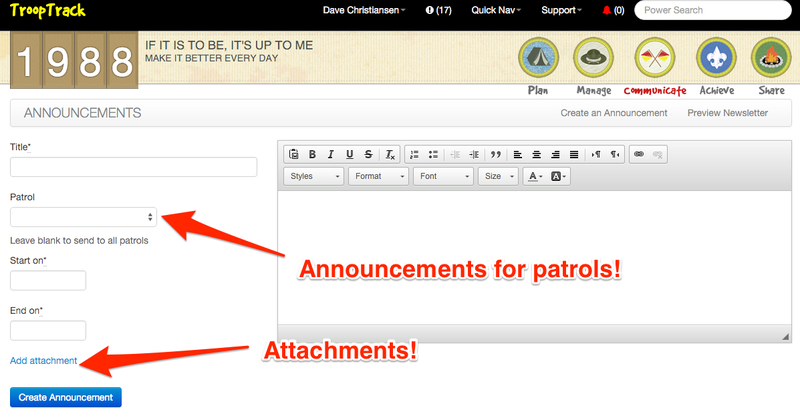 Patrol announcements will only appear on newsletters sent to a family with a member from that patrol. 3) You can now include attachments with announcements. 4) The newsletter has been re-designed to have an easy-to-read two column layout. 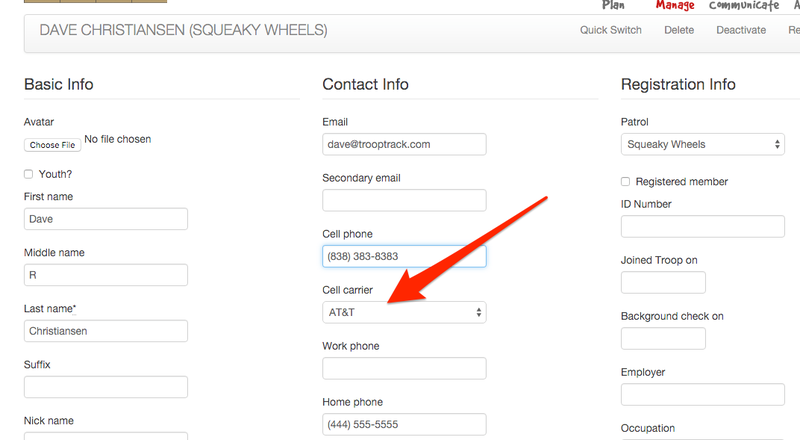 1) A member's cell phone carrier, which is required if you want to be able to send text messages, is now editable from the user profile. It was always editable from Communicate -> Text Message Settings, but a user pointed out that it should be on the profile as well. So we added it. 2) Some awards with multiple levels of requirements were not being completed properly when you selected the "all requirements completed" option when using Achieve -> Record Progress (bulk). It was only completing the first level of requirements with no sub-requirements. This behavior has been fixed and it will now update ALL requirements, regardless of how many levels of requirements there are. "A question to other Boy Scout Troop users. Would others find it useful if, on the Rank page under the Achievements tab for a scout, that merit badges that can be applied to a rank might list show a check mark for completion or a percentage completed for each merit badge? This way a scout could list the merit badges he plans to work on towards a rank and in a quick summary see what he has left to do." Please add a comment if you have thoughts on Mike's idea. I really want to do something in this area of TT soon so now is your chance to influence where this heads. Uploading multiple photos using Safari or Chrome on iOS is NOT working and is causing duplicates. If you attempt to upload 6 multiple photos, for example, it will simply upload the first photo you selected 6 times. Please let your users know so they can avoid frustration. We are working on a fix for this problem. 1) If you printed a very large number of award cards you could get an error. This problem is fixed. 2) When you send event messages you can choose to send it to people with a particular RSVP status (coming, not coming, not responded, etc). If you happened to select a status that no one had chosen, the email would still go out, but only to you. We've changed it so that instead of sending a pointless email, TroopTrack tells you that no one has RSVP'd with the status you selected. 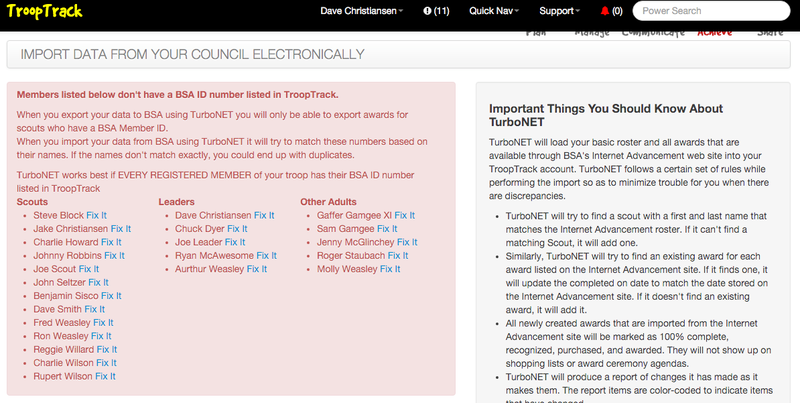 3) When you use the TurboNET roster import or TurboNET advancement report we display a list of users with no BSA ID number in TroopTrack. This list was hard to read, so we divided it into three columns for scouts, leaders, and other. 1) The "All My Requests" page now shows only open tickets by default. You can see all solved tickets by clicking on the "Solved" link in the title bar. 2) The patrols/dens/units page now includes a count of the youth in that patrol/den/unit. 3) Custom household reports will now only include households with at least one family member who is active in your organization. 4) Printed BSA advancement reports now sort the awards by the last name of the recipient instead of the first name. 5) The date a member joined a troop is now available in custom user reports. 6) Access level is now available in custom user reports. 7) There is now an option to print award cards without the dashed lines on the edges. 8) When adding custom awards there is now an option to make them repeatable. 9) Custom awards are now available to all members, not just youth. 10) The merit badge counselors (by merit badge) page now lists counselors in alphabetical order. 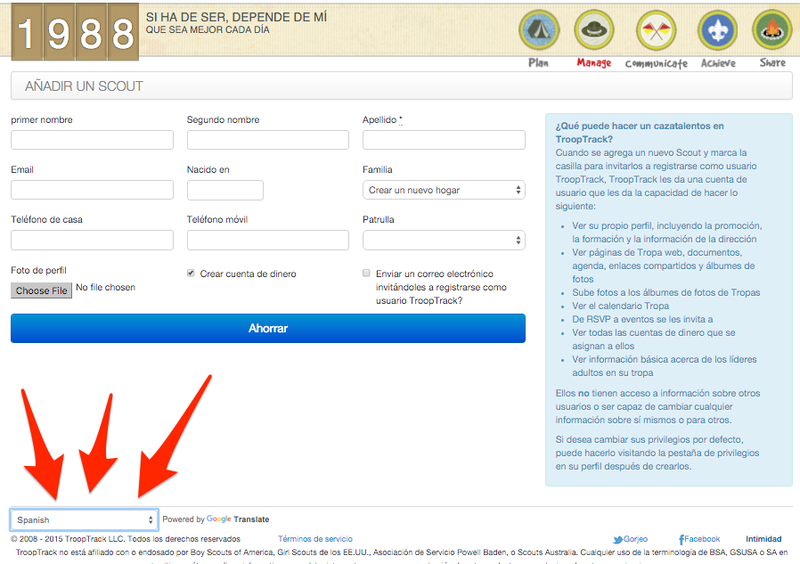 11) You can now translate every page in TroopTrack to nearly any language using Google Translate. There is a Google Translate widget at the bottom of every page - just click it to change the language. This is a service from Google and we can't guarantee the accuracy of the translations. I've included a screenshot of the add new scout page translated to Spanish. Phew! Have a great weekend. 1) Email templates. 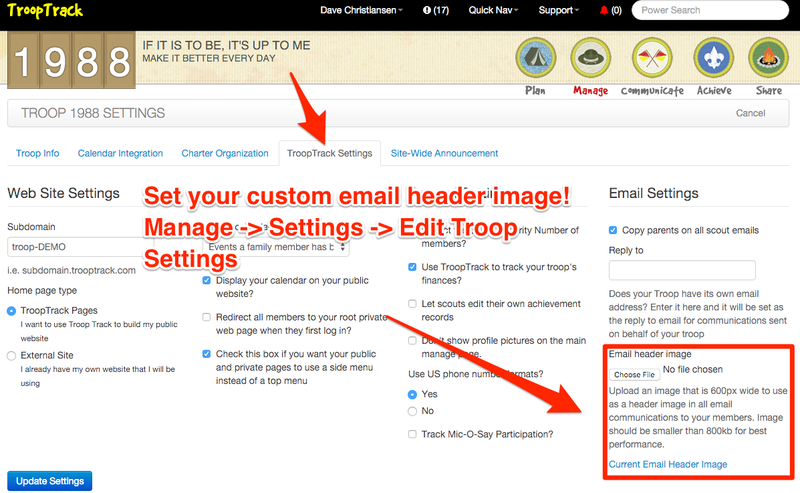 See the photo below - emails from TroopTrack now use a nicely formatted template that has been tested to work in virtually all email clients. Notice the image at the top of the email - we will soon release a feature that allows you to upload a custom header image just for your unit. 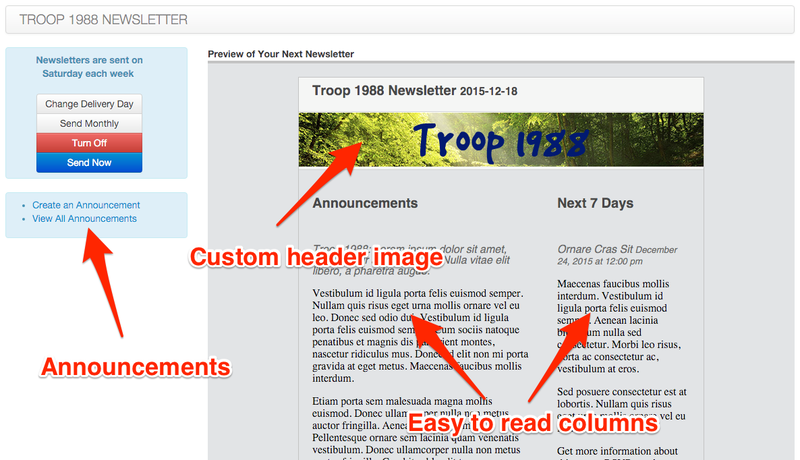 We will also be redesigning the newsletters to use a two-column layout. 2) Help desk changes. Previously if we solved a ticket it would be re-opened if you added a comment to it. This was fine in most cases, but in a number of cases we have had users add comments to tickets we solved months ago, often times with a completely new problem. To avoid this problem we have disabled the ability to comment on a solved ticket after seven days. 3) Backlog of really old tickets. As I've mentioned before, we were completely unprepared for the fall rush of 2014. We didn't have enough help desk staff members and we were completely swamped with support requests. We have since hired and trained enough people that we were mostly able to keep up with the 2015 fall rush, but we still have about 1000 unprocessed tickets that are over a year old. :( We started reviewing those tickets and found that many of them were fixed as they were reported by other users. We also realized that it would take us months to get through them all. So... we have made a decision to close tickets that are more than a year old. That should happen later today. If one of your tickets is closed you will get an email. If you feel that ticket is still relevant, all you need to do is log in to TroopTrack within seven days and add a comment telling us that the ticket is still important. I appreciate that some of you may be upset by the arbitrary closing of older help desk tickets. Please be assured that we didn't take this decision lightly and that if you add a comment to your ticket it will automatically be re-opened and re-prioritized with recent tickets (see #4). 4) Helpdesk followup improvements. We sometimes struggle to followup on helpdesk tickets when you add a comment. One of the changes we released this morning helps us to better identify tickets that you have added a comment to. This works by bumping tickets you have commented on up in priority. 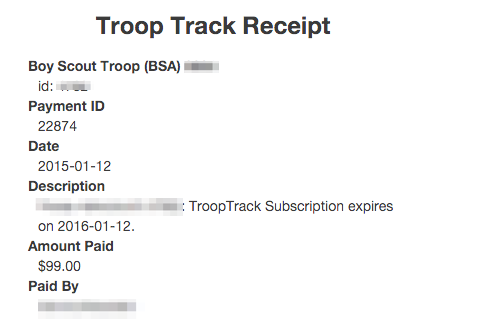 You asked for it... You can now print pre-filled BSA Youth Applications with TroopTrack. Also, for the future... I'm thinking about adding a self-registration workflow to TroopTrack. You would provide joining members a link and they would fill out an application. That data would go straight into TroopTrack as a pending member (i.e. no access) and they would get a completely filled out membership application. They would sign the app, turn it in to you, you would mark them complete and they would be able to log in to TroopTrack. What do you think? How would you like to be able to print your BSA Adult Application pre-filled from TroopTrack? 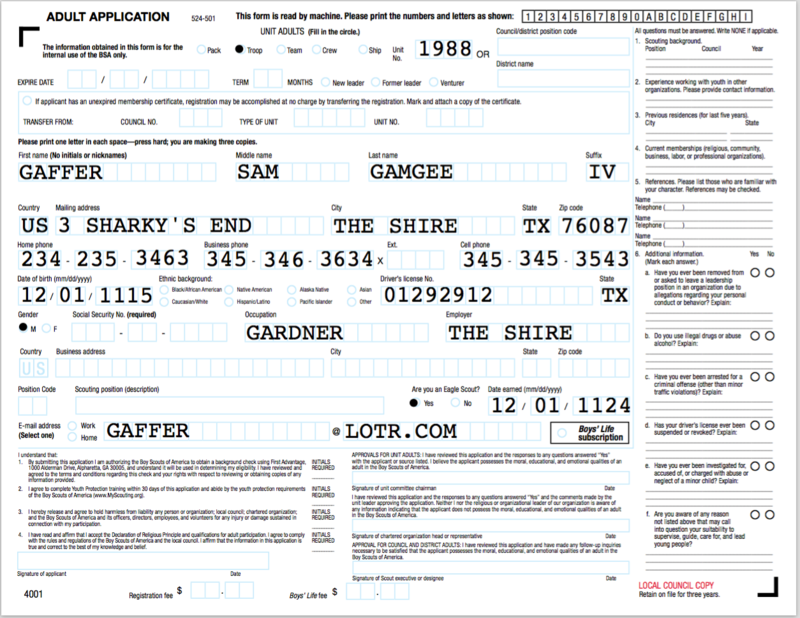 We are re-chartering our units and frankly... the paperwork is a bit of a pain. Sunday night I thought "I can make this easier". I started on it Monday morning and guess what? Go to Manage -> Members -> BSA Adult Applications and check it out! This morning we pushed a minor update to the calendar. We were not displaying multi-day events properly when there were other events on the same day as a multi-day event. This is now fixed. Thanks to everyone who reported this problem! This morning we pushed a number of updates, one of which is an important change to our customer support process. 1) The mailing list confirmation email listed recipients multiple times. This is now fixed. It was not causing recipients to receive multiple emails. 2) Event emails now include the date the signed permission form is due. 3) Help desk emails have been changed so that replies to automated emails no longer go to our staff. THIS IS IMPORTANT! When our staff makes a comment on a help desk ticket, you get an email. That email was set up so that if you replied it went to our staff member directly. This was causing serious problems on our side because it took the customer support process out of our help desk and made it very difficult to track. This no longer works - replies to these emails will go nowhere. PLEASE USE THE HELPDESK INSTEAD. Some of you may find this frustrating. We understand. Please be patient with us and understand that this is a short term solution. In the long term we will add the ability to update tickets directly via email.